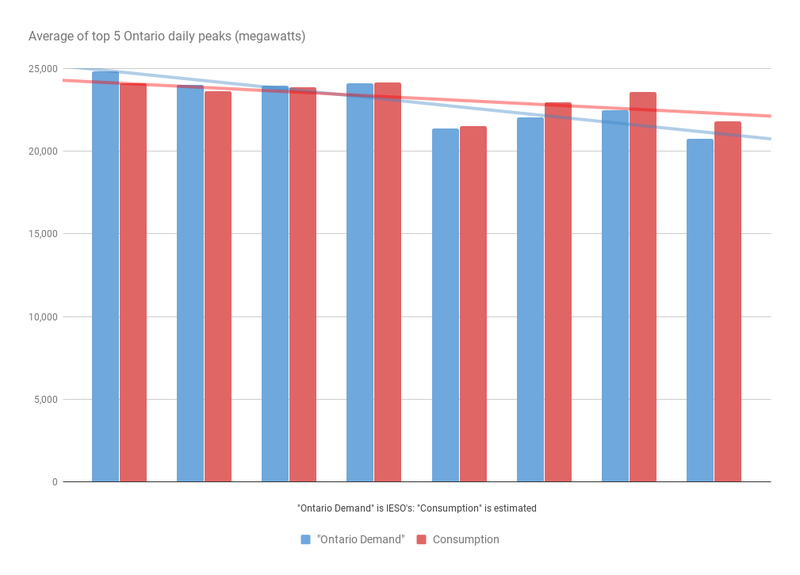 Ontario’s peak demand days typically don’t happen at this time of the year. Yet with hot weather persisting, and in spite of summer’s end last week, the province experienced new annual peaks this week of 21,786 MW on Monday and 21,542 MW on Tuesday. 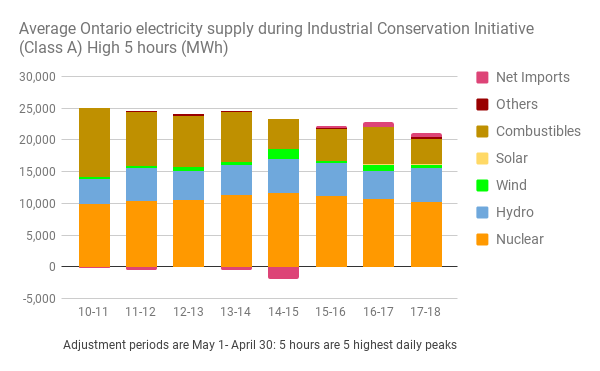 Generators did their part to help meet the peaks, as well as Ontario’s consumers participating in the Industrial Conservation Initiative (ICI) and other demand response initiatives. According to preliminary analysis, consumers participating in the ICI are estimated to have reduced peak demand by over 1,500 MW this week. By reducing demand during peak periods, ICI participants can both reduce their electricity costs while helping to defer the need for investments in new electricity infrastructure that may otherwise be needed. They didn't mention if the 21,783 MW remains 2017's annual peak it will be a record annual low (the 3rd one recorded in the past 4 years). The subsidy work by setting a ICI participant's share of "global adjustment charges as their share of consumption during the 5 highest daily peaks measured, essentially, by demand from the system operator's generators/imports. This means an ICI participant, also known as a Class A consumer, can greatly reduce their electricity bill throughout the year by reducing consumption during the 5 peak hours. The avoided global adjustment costs are transferred to Class A consumers. I won't explain the entire mechanism here - I wrote on it in May 2015 and we are now experiencing the impacts of the expanded ICI that Bruce Sharp foresaw last October. All consumption was 136.29 TWh, and global adjustment charges $12.064 billion - an average rate of $88.52/MWh. By paying $50.42/MWh instead of $88.52, in the past year the 29.53 TWh consuming ICI consumers transferred $1.125 billion to Class B consumers. 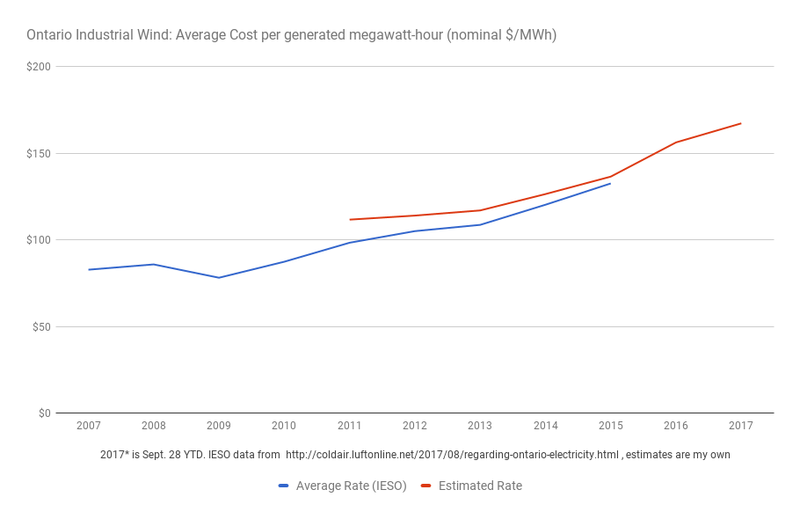 Unless you work at the IESO, that is considered extraordinarily expensive capacity. Peter Gregg delivered a speech to the Ontario Energy Association on September 25th - his first as "the head of the IESO." Having a strong commitment to execution. Bragging about $750,000 capacity doesn't strike me as managing political risks, so much as practicing sycophancy. Leonard Kula, the IESO's Vice-President, Market and System Operations, delivered a presentation at the recent Alberta Power Symposium. At times we have to reduce the output of these facilities to go ahead and manage congestions and/or surplus conditions, and once they dispatched down they are very quick and flexible to be dispatched back up. The IESO is to be commended for making wind more valuable, but it needs to be recognized it continues to make it more expensive too - on a per unit basis, as well as overall, the cost of industrial wind continues to rise in Ontario. "Ontario’s peak demand days typically don’t happen at this time of the year." The IESO stated that, and I shared it at the beginning of this work. Perhaps this late September's heat is related to a long wind drought - coming as it did at the end of the 3rd successive IESO week (Wednesday to Tuesday) of little output from Ontario's industrial wind turbines. 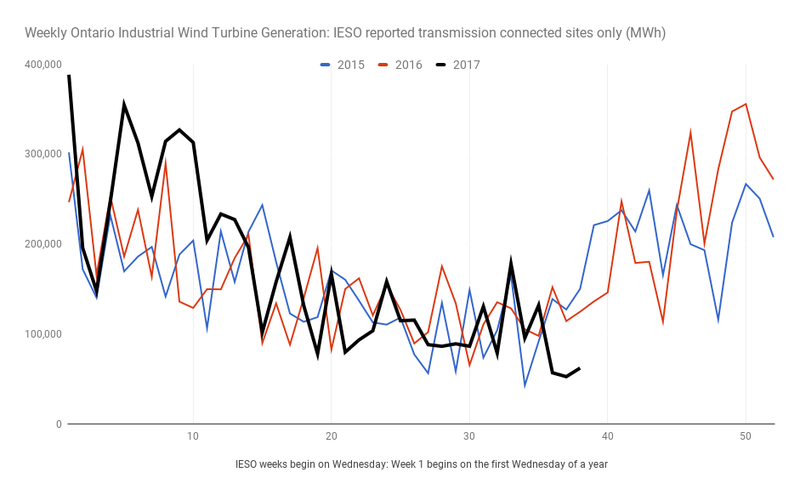 When September 25th's "Ontario Demand" peaked at 21,786 MW (the year's high) in hour 17, the 4300 megawatt capacity industrial wind fleet reported on by the IESO was producing only 67 MW. When When September 26th's "Ontario Demand" peaked at 21,542 MW in hour 17, the 4300 megawatt capacity industrial wind fleet reported on by the IESO was producing only 243 MW. Wind now has a capacity credit near nil in Ontario. 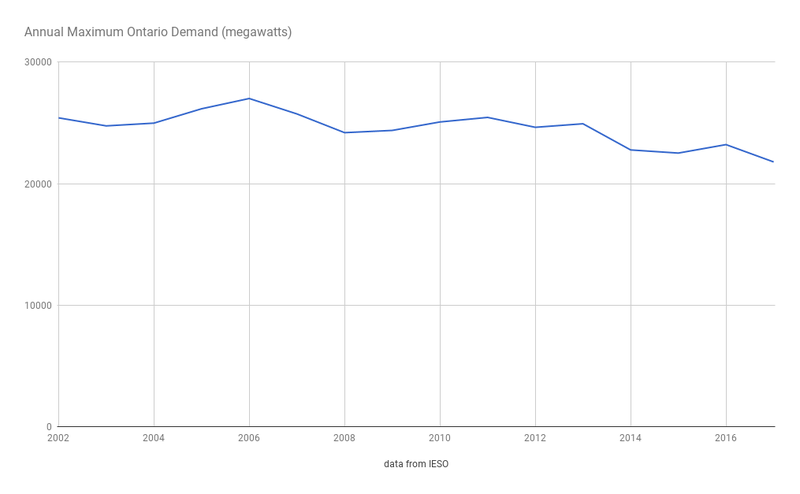 But it must be noted the measure here is demand from the IESO's transmission-connected (Tx) generators, and not actual consumer consumption of electricity. The difference is not insignificant. A graphic from Leonard Kula's Alberta presentation shows the growth in distribution-connected (Dx) capacity - as well as Tx. 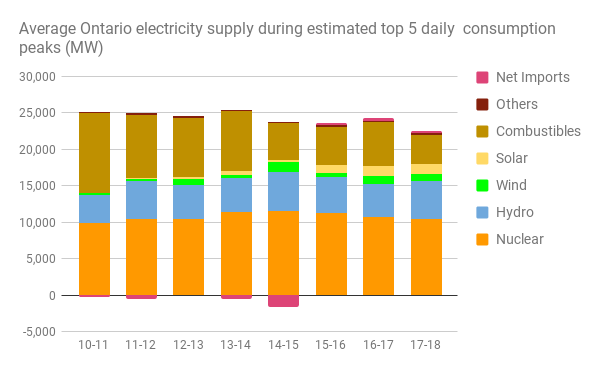 It should be noted that due to the increasing penetration of embedded solar generation, the grid demand profile has been changing, with summer peaks being pushed later in the day. The difference is not simply peak demands declining less. If hourly production from embedded generators, particularly solar, was competently reported, the peak would probably not have moved later in the day and the contribution to meeting peak demand would look quite different. There's a number of interesting aspects one could examine here. One of particular interest to me is the capacity credit, or value, of a new generator is meaningful mainly in relation to the system it is joining. Solar moves quickly from high capacity value, in systems with afternoon peaks, to low capacity value (once solar covers the difference in demand between the afternoon and evening hours). There's many complexities system operator's are now dealing with. Few are dealing with later peaks due to paying extraordinary rates to contracted solar generators they can't even bother to report on, combined with the declining capacity value of wind which, in Ontario, also often sees lower output later in the afternoon - as solar is waning, and the payment of extra-extraordinary payments for an ICI scheme that is obviously pretending to be a capacity plan allegedly to deal with problems the IESO continues to create.